Produktinformationen "Marvin Test Solutions: MV-GX3610: FPGA PXI Card with 80 Channel mLVDS Buffer Module"
The Marvin Test MV-GX3610 is a 3U PXI FPGA card with 80 mLVDS channels. 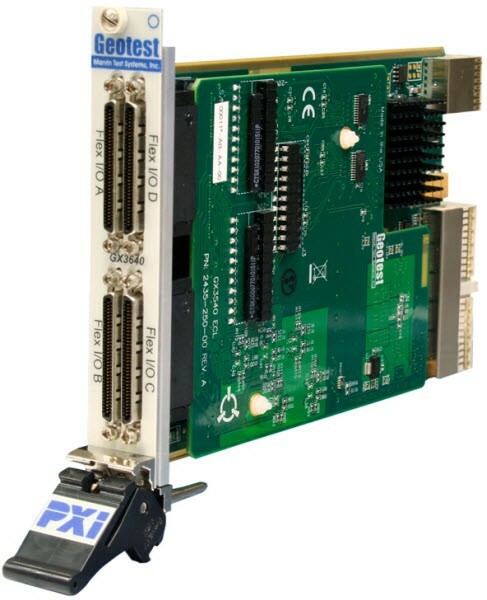 The MV-GX3610 card is comprised of a MV-GX3510 80 channel mLVDS buffer expansion module and a MV-GX3500 FPGA card. The MV-GX3610 employs the Altera Cyclone III FPGA which can support clock rates up to 150 MHz and features over 55,000 logic elements and 2.34 Mb of memory. The design of the FPGA is done by using Altera’s free Quartus II Web Edition tool set. Once the user has compiled the FPGA design, the image can be loaded into the FPGA via the PXI bus interface or via an on-board EEROM. The Marvin Test MV-GX3610’s FPGA device supports up to four phase lock loops for clock synthesis, clock generation and for support of the I/O interface. An on-board 80 MHz oscillator is available for use with the FGPA device or alternatively, the PXI 10 MHz clock can be used as a clock reference by the FPGA. The FPGA has access to all of the PXI bus resources including the PXI 10 MHz clock, the local bus, and the PXI triggers, allowing the user to create a custom instrument which incorporates all of the PXIbus’ resources. Control and access to the FPGA is provided via the Marvin Test MV-GX3610’s driver (GxFPGA) which includes tools for downloading the compiled FPGA code as well as providing register read and write functionality. The board is supplied with the GXFPGA library, a software package that includes a virtual instrument panel, and a Windows 32/64-bit DLL driver library and documentation. The virtual panel can be used to interactively program and control the instrument from a window that displays the instrument’s current settings and status. In addition, interface files are provided to support access to programming tools and languages such as ATEasy, LabView, LabView/Real-Time, C/C++, Microsoft Visual Basic®, Delphi, and Pascal. An On-Line help file and PDF User's Guide provides documentation that includes instructions for installing, using and programming the board. Weiterführende Links zu "Marvin Test Solutions: MV-GX3610: FPGA PXI Card with 80 Channel mLVDS Buffer Module"